- Am I using the correct turbulence model for the type of results I am looking for? - Do I have an appropriate Y+ value and a sufficient number of inflation layers? - Am I using the right wall function for my problem? In the laminar sub-layer region (Y+ < 5) inertial forces are less domineering and the flow exhibits laminar characteristics, which is why this is known as the low-Re region. Low-Re turbulent models (e.g. the SST model) aim to resolve this area and therefore require an appropriate mesh resolution to do this with accuracy. This is most critical for flows with a changing pressure gradient where we expect to see separation, as observed below. In the law of the wall region, inertial forces strongly dominate over viscous forces and we have a high presence of turbulent stresses (this is known as the high-Re composite region). If using a low-Re model, the whole turbulent boundary layer will be resolved including the log-law region. However, it possible to use semi-empirical expressions known as wall functions to bridge the viscosity-affected region between the wall and the fully-turbulent region. The main benefit of this wall function approach lies in the significant reduction in mesh resolution and thus reduction in simulation time. However, the shortcoming lies in numerical results deteriorating under subsequent refinement of the grid in wall normal direction (thus reducing the Y+ value into the buffer layer zone). Continued reduction of Y+ to below 15 can gradually result in unbounded errors in wall shear stress and wall heat transfer (due to the damping functions inherent within the wall function approach). What results am I interested in and am I using the right turbulence model? If our aim is to accurately predict the boundary layer velocity or thermal profile, or if the developing boundary layer will tend to separate (due to a changing pressure gradient – and not because of sharp edges or discontinuities in the geometry), then we recommend the use of a low-Re model. Low-Re models are also required for accurate pressure-drop or drag calculations. We highly recommend the use of the Shear Stress Transport (SST) model, but all ω­-based models or ε-based models with enhanced wall treatment may be used. For high speed external aerodynamic flows, the one-equation Spalart-Allmaras model (with Y+ < 2) may also be considered to reduce the computational time. Alternatively, for flows where wall-bounded effects are not a priority, or if separation is expected to occur only due to sharp changes in the geometry, an ε-based wall function approach is more than sufficient. In ANSYS CFD, all ω-based models and the SST model are capable of resorting to a wall function formulation (automatic wall treatment) in the presence of coarse mesh resolutions near the wall without any further user input. 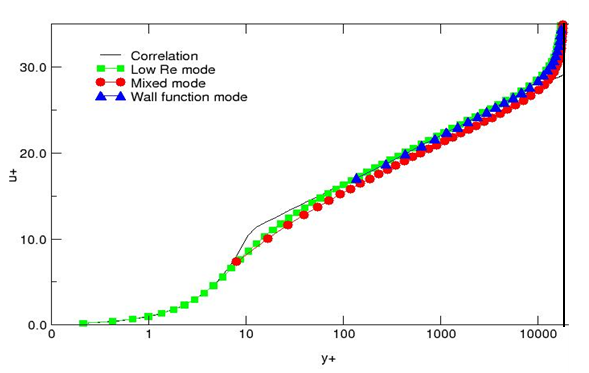 Wall function models are also useful for calibrating our CFD models, due to the decreased simulation time. What is my Y+ value and do I have a sufficient number of prism layers? When using low-Re models or any models with enhanced wall treatment, the average Y+ value should be on the order of ~1 to ensure we are capturing the laminar sub-layer. When using wall function models, the Y+ value should ideally be above 15 to avoid erroneous modelling in the buffer layer and the laminar sub-layer. High quality numerical results for the boundary layer will only be obtained if the overall resolution of the boundary layer is sufficient. This requirement in some cases is more important than achieving certain Y+ values. The minimum number of cells to cover a boundary layer accurately is around 10, but values of 20 are desirable. The total thickness of the prisms should be implemented such that around 15 or more nodes are actually covering the boundary layer. Our next post in this series on the turbulent boundary layer will cover a very useful and practical technique to post-process the resolution of the boundary layer, and offer insight into modifications required to improve accuracy. Am I using the right wall function? 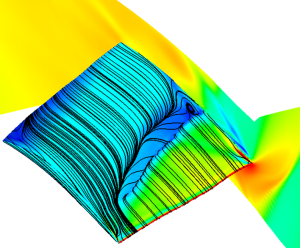 In ANSYS CFD, all turbulence models are y-plus independent. However selecting the most appropriate wall function is dependent on level of refinement of our wall adjacent mesh, or the relative scales in our flow. Use of the standard wall function (ε-based models) implies that our boundary layer mesh lies entirely within the log-law region of the boundary layer. For industrial applications, this in fact might be difficult to achieve due to varying geometrical and velocity scales associated with our model – and therefore grids inherently designed with arbitrary refinement. We highly recommend the use of the scalable wall function, which offers an elegant solution to this ambiguity often encountered. This wall function virtually displaces the mesh to a Y+ ~ 11.225 (transition to the log-law composite layer) irrespective of the level of refinement, thereby avoiding the erroneous modelling of the laminar sub-layer and buffer region. It is also important to note that for grids designed with a Y+ > 11.225, the scalable wall function will provide identical results to the standard wall function. Enhanced wall treatment may further be selected for ε-based models on refined low-Re grids, and is also formulated such that it can perform well for meshes of intermediate resolution. However the use of enhanced (or non-equilibrium) wall treatment for low-Re modelling of the turbulent boundary layer is generally not recommended and more confidence in our solution can be obtained by selecting a suitable ω­-based formulation, such as the SST model. I have read your article and there is one think that I do not understand. 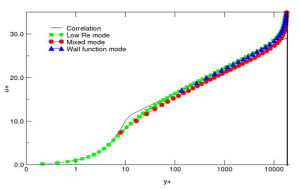 "Scalable wall function - This wall function virtually displaces the mesh to a Y+ ~ 11.225 (transition to the log-law composite layer) irrespective of the level of refinement, thereby avoiding the erroneous modelling of the laminar sub-layer and buffer region." Does this mean that using Scalable wall function the mesh will be rebuilt in the way to consist both phenomena: laminar and transition flow? If your model has varying geometrical or velocity scales, then consequently your grid and near-wall refinement will have varying levels of resolution. To maintain consistency in our modelling approach the scalable wall function will virtually displace the near-wall mesh to a y+ value of 11.225, which is the transition to the log-law region. This is necessary since epsilon-based models are not ideal for modelling the laminar sub-layer and the scalable approach internally adjusts the mesh to ensure this region is not resolved. The scalable approach is the default option in ANSYS CFX and is an available option in ANSYS Fluent. The scalable wall function will not capture laminar or transitioning flow, as it is purely a turbulent wall function approach. To model aerodynamic flows with laminar-to-turbulent transition, we encourage the use of the SST transition model. This low-Re model requires fine resolution in the near-wall region due to the complexity of transitioning flow. You stated that with Scalable Wall Function method, it virtually displaces the mesh to a Y+ ~ 11.225. And on top up the page there is figure showing buffer layer yplus between 5 to 30. So it seems somehow wrong to place first layer in buffer layer! 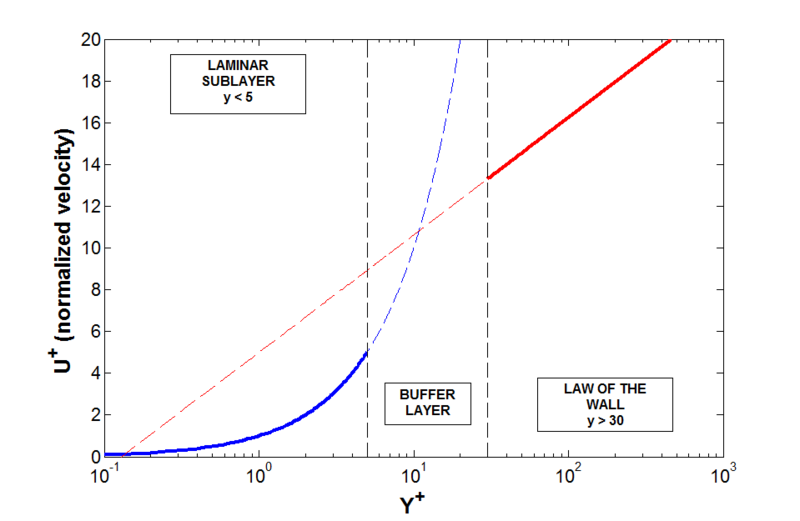 The scalable wall function will displace the mesh to a Y+ ~ 11.225 since this is noted as the numerical transition point from when a boundary layer operates in the laminar sub-layer to the turbulent log-law. It is simply a virtual scale of first cell height so that the solver internally operates as if we are in the log-law region and not within the laminar sub-layer. how does ansys calculte in the near wall region ?is it like this :at the first cell,use emprical correlation,and from the second cell solving k-e equation ?If it is like this ,why we need sufficient boundary layer? My geometry is wing of airfoil cross section inside a rectangular box domain. I am using Standard k-e model. what should be my y+? Does k-e model is good or i should move to another model. I am modeling a shell and tube heat exchanger and i am having problem with pressure drop on shell side. My analytical calculations give pressure drop of 470 Pa while fluent gives 2300 Pa. Average Y+ value on tube walls is 20. Turbulence model is K-e with standard wall functions. Kindly help me in this issue. It is difficult for us to comment on this, since we do not have an understanding of the geometry or your choice of boundary conditions. Nor can we assume that your analytic calculations are in fact valid for the problem setup. The discrepancy in the result is likely not to be solely due to mesh resolution, rather it is likely to do primarily with the choice of boundary conditions. Our advice would be to attempt one of the tutorials from the help guide which address heat transfer to gain an understanding of a representative problem setup. But we said "However the use of enhanced (or non-equilibrium) wall treatment for low-Re modelling of the turbulent boundary layer is generally not recommended and more confidence in our solution can be obtained by selecting a suitable ω­-based formulation, such as the SST model." I wonder if these two speaking are contradictory for Enhanced Wall Treatment used in Low-Re? So how we to understand Enhanced Wall Treatment for solving boundary layer? It is necessary to understand the limitations and range of applicability of the eddy-viscosity turbulence models. No single model can be applied to all problems of interest - however the omega-based models and in particular the SST model are often preferred, particularly because of their favourable wall treatment. They are relatively more robust near the wall, and the y-plus insensitive treatment is facilitated through the automatic wall treatment. They are also relatively easier to combine with additional physics, such as transition. There is still ongoing development for epsilon-based models, in particular the y-plus insensitive treatment through the enhanced wall treatment and for many problems the use of realizable k-epsilon with enhanced wall treatment, for instance, will provide a valid result. 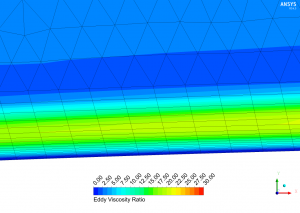 In this post we aimed to provide our recommendation for a baseline model to capture boundary layer flows for a wide range of applications, and due to its robustness, we have opted for the SST model. we use a wall function for boundary layer so why do we need to have some nodes in this region? my English is not good enough. We respectfully suggest that you re-read this post and other related posts on wall functions/full resolving the boundary layer on our Blog. In transient simulation of a flow, the Y+ is not a constant value and alters during time. Which Y+ should I consider to evaluate the cell size near the wall? If I want to use non-equilibrium wall function, what's the range that is suitable to the non-equilibrium wall function ? whether is it suitable as long as the value of Y+ is larger than 11.25 ? I want to simulate the process of wedge of water-entry,could you please give me some advice on choosing the wall function ? what I most concern is the splashing during the the process of wedge of water-entry. Thank you so much.Best wishes for you and I am longing for you reply. The non-equilibrium wall function is useful for log-law resolution, and is different from the standard wall function is that it can partly take into account the effects of pressure gradient. However its scope of applicability begins to fall apart when you take into account severe pressure gradients leading to boundary layer separations, and strong body forces which your case will be subject to. In this case, it is preferred to use the enhanced wall treatment approach with y-plus values ~1. Thanks a lot for your posts! As I'm normally involved with internal flows simulation, by your suggestion I chose to switch from ke to kw-SST, as sometimes I can see some flow detaching and I'm interested in heat transfer too. But I still have some confusion about some terms normally used when speaking about turbulence (maybe synonymous), and for the physics. When I have to solve the viscous sub-layer in order to have an y+ of 1, why should I still use an approximation like a wall function? I mean, if I have a y+ of 1, it means that surely I'm really close to the wall with my calculation point, so why should I use a wall function to model the behaviour of the flow? If I would be able to add more layers near the wall, are NS equations well discretised as well at the wall anyway, and so I could switch off wall functions? Wall functions are used when the inflation layers do not sufficiently resolve the boundary layer. 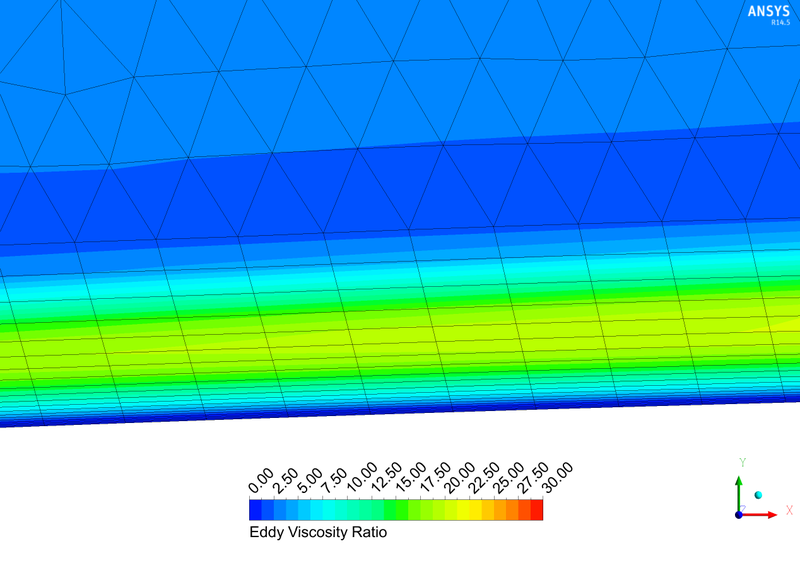 If you resolve the viscous sublayer, wall functions can still be used for the turbulent layer, depending on the y+ value. One of the benefits of the k-w SST model is that it will automatically use the low-Re formulation in the viscous sublayer and will use the wall function if the cell height is in the log-law layer. I am designing a CD nozzle for a turbine. I meshed it in ICEM CFD.I took k-epsilon model with standard wall functions. I need to find the pressure and temperature at the walls of CD nozzle. Which wall function should I choose to get correct pressure value at the walls and get the correct velocity value at the exit? 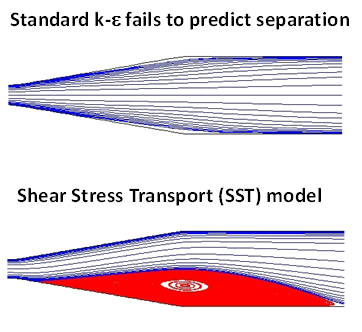 To obtain accurate pressures and velocities, the recommended turbulence model would be the k-w SST. You will also need to fully resolve the boundary layer, keeping in mind that if Pr>1 for your problem, the thermal sublayer will be much thinner than the momentum sublayer. You boundary layer mesh will need to be adjusted accordingly so that both the thermal and momentum sublayers are captured appropriately. The k-w SST model is likely a better choice for your problem as k-w models are known to outperform k-e models with respect to boundary layer flows. The fact that mesh refinement causes even further deviation from the analytical results supports this as the closer to the wall you refine, the more pronounced the deficiencies in the k-e model become. The SST model, combined with the other recommendations from this blog series should improve your simulation. I have two question related to Y plus. 1- I am trying to have y+<5 while using K-epsilon method (enhanced wall) in a 5 m pipe. My y+ results give a value of less than 5 but the earlier values are about 8 and then it downs to less than 3 severely. Is this ok or not? Y plus value must be less than 5 throughout the geometry wall? 2- My goal is to find pressure drop throughout a pipe. The amount of pressure drop changes with quality of mesh even for the Y plus value less than 5. For example for the y+=3 I have dp=3600 Pa and for y+=0.5 I have dp=3400 Pa. which one is true? 1) For enhanced wall functions, the average y+ value needs to be around 1 in order to ensure the laminar sublayer is captured. Can you please explain the difference in enhanced wall treatment and enhanced wall function.? Utilising wall functions is one of the methods taken to approach the accurate modelling of the near wall region. In short, the viscous sub-layer and its surrounds are not physically resolved, rather empirical formulas, or “wall-functions” are used to bridge the gap between the wall, and fully-turbulent region. For more information concerning different wall treatments and their requirements, Section 4.16 of ANSYS Fluent’s Theory Guide can help to distinguish different uses and capabilities. I ma simulating a ventilation box have a source of heat in the middle. I was used Realizable k-e model for this problem, and compared the results with the experimental one. I got about 5 % of error. I was used tetrahedral patch conforming mesh with yplus =32 and standard wall function is selected. Is my selection for yplus and wall fucntion is correct or not, with ignoring accurate results that i got. The choice of a turbulence model is based off of a number of things in your simulation. The Realizable k-epsilon model is definitely appropriate for free stream flows; however, you may need to apply a k-omega SST model to accurately model both the free stream flow; and near wall interactions. Y + does become important when modelling heat transfer and CHT. Ideally the Y + values would be close to 1 at the surface to ensure the transfer of energy is smooth between bodies.